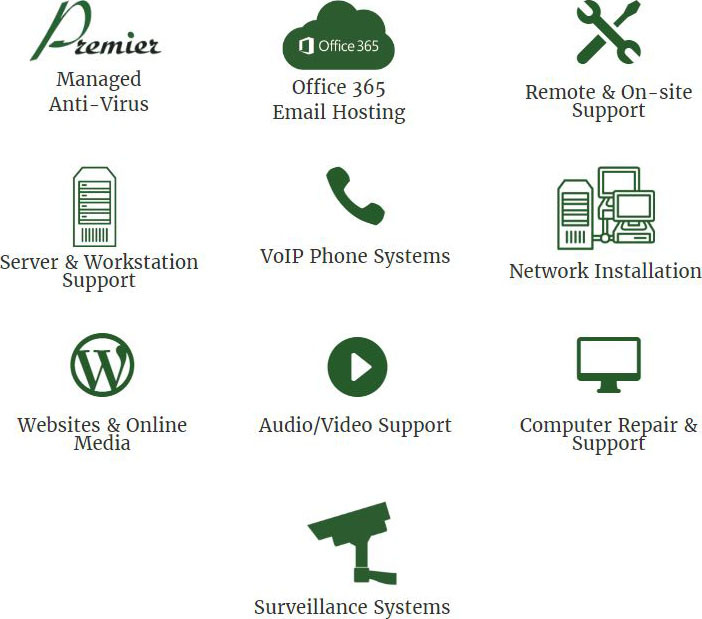 RCR Premier combines Anti-Virus, Anti-Malware, Remote Support, Monitoring, Updates, Digital Cleaning, and Encrypted Data Backup. Brought to you by RCR Technology Group. A company you know and trust. Contact us to learn how to get started today! RCR Technology Group provides a number of services for small and medium-size businesses. Our company provides IT support for businesses that need internal IT support but not a high enough need to staff it. Weekly reports of your workstations, backup, and network via the email of your choice. Anti-Virus and Anti-Malware Combined: One Anti-virus on the entire network ensures no lapse in coverage for the workstations and network. Remote Support: Get the fastest support possible. Monitoring: Keep a close eye on hardware and software; from hard drive health to product key information. Automated Updates and Patches: Keeping Windows up to date is an additional security and workflow measure that most end users skip. We automate this process for Windows, Java, Adobe, and all relevant runtimes. Automated Digital Cleaning: We clean up unnecessary log files that gather and take up space and resources. Encrypted Data Backup: In the event of hardware failure, accidental deletion, or threat, we have keep a copy of your data to be restored. Unlimited Support: Whether remote or on-site, RCR Supports your registered devices at no additional cost. The only additional cost that you will incur would be the cost of new hardware whether your expanding your device list or replacing old hardware. Your monthly cost will increase with the addition of hardware. Most businesses have a variable IT Support cost. With this model, you’re able to accurately project your IT support costs for the entire year with the only variable being hardware failure or need to expand your network and devices. All of the automated features listed above will be paid monthly and support hours will go against hours that are purchased in blocks. This payment will be made up front. The hours will be deducted as the client requires support. Each month the client will receive an invoice with an itemized description of work done within the month. These invoices will have a zero balance until hours run out. The client will be notified when hours fall below five (5) hours so that additional hours can be purchased. There is no expiration for unused hours. Time is deducted by the quarter hour. If it only takes 15 minutes to solve the issue, only 15 minutes will be deducted. On average, our clients purchase up to three 48 Hour Blocks per year, one block every four months. RCR Technology Group is your Information Technology ally. We wish to provide a stable IT environment with your current infrastructure and meet with your organization frequently to talk about growth and improvement moving forward. We understand that transition from a previous provider can be challenging and we face those challenges professionally, tactfully, and patiently. RCR can work within your organization’s budget to plan and phase out technology growth. We will also be forthcoming in advising you on industry trends. It is not always a great decision to jump on the latest technology but if you wait too long, you may miss a great opportunity to grow. We will work with you to find that balance. On behalf of myself and the staff at RCR Technology Group, thank you for considering doing business with us and we look forward to a prosperous relationship.